June 21, 2012 in News, Tips. With SmartMS v1.0.1 out you can now use WebGL! Download HelloWebGL.zip (51 kB), it contains the first demo (in .opp form and pre-compiled), as well as the initial WebGLScene units which you’ll have to copy to your “Libraries” folder (the WebGL import units should have been delivered in v1.0.1). GLS.Vectors: contains vector manipulations types as well as a collection of helpers to operate on them. GLS.Base: contains Pascal classes to simplify basic OpenGL tasks revolving around buffers and shaders. May 31, 2012 in News. This is an informal announcement that work has begun on WebGL and bringing some of GLScene browser-side! June 10, 2010 in News. 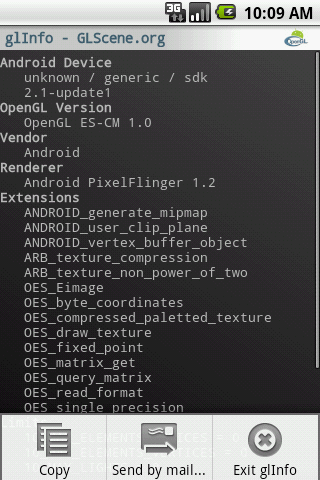 Just published glInfo in the Android Market, this is a simple utility that provides information on the OpenGL ES driver of the device it’s running on (version, supported extensions, limits…) and allows to copy or mail the whole report. It is named after from the glInfo utility that used to be hosted at Tom Nuydens’s Delphi3d site. June 7, 2010 in News. I’ve updated the GLScene.org main page with information on where you can find support newsgroups and forums, since the nntp newsgroup went down and are unlikely to come back up (thanks Paul Van Dinther, now from PlanetInAction, for the help in accessing the wiki).